Sorry, but if you're looking for photos from the World Masters Athletics Championships in Torun, Poland, in March, I didn't attend. Looking for photos from the 2019 British Masters Indoor Championships, at Lee Valley Stadium on 9 and 10 March? They are here. Here's a great gallery of photos from the 2019 Masters Athletics Inter Area March at Lee Valley, on Sunday 24 February. You can see a small gallery of photos I took at the Tenterden Folk Festival, on Sunday 7 October, via the page here. I took a great set of photos of the competitions at the 2018 SCVAC League Final, at Ashford, on Sunday 30 September. They can be found via a link from this page of my site. I have several thousands of photos from the World Masters Athletics Championships, held in Malaga, Spain, from 4-16 September. These are mostly (but not exclusively) of the British athletes competing there. The photos in the galleries are my personal selection from each day of the Championships. You can see them here. Before my disaster at the BMAF Championships on 25 August described here), I did manage to shoot a fair number of photos of action during the morning and early afternoon. They are here. I was not in Birmingham to see or shoot any of Sunday's events. I have added a gallery of 226 photos from the Masters London Grand Prix meet, at Lee Valley Stadium on Sunday 19 August 2018. They are here. I've added a gallery of 213 photos from the inaugural Masters Grand Prix meet, at Sheffield on 23 June 2018 to my Masters Athletics 2018 page, here. A link to a gallery of 118 photos from the Southern Counties Masters Championships at Ashford on Saturday 26 May 2018 can be found here. If you are looking for photos of the Rochester Sweeps Festival 2018, you will find them here. Four galleries. Enjoy! You can view all of the images from my November 2016 exhibition "Watching The River Flow" via this page. 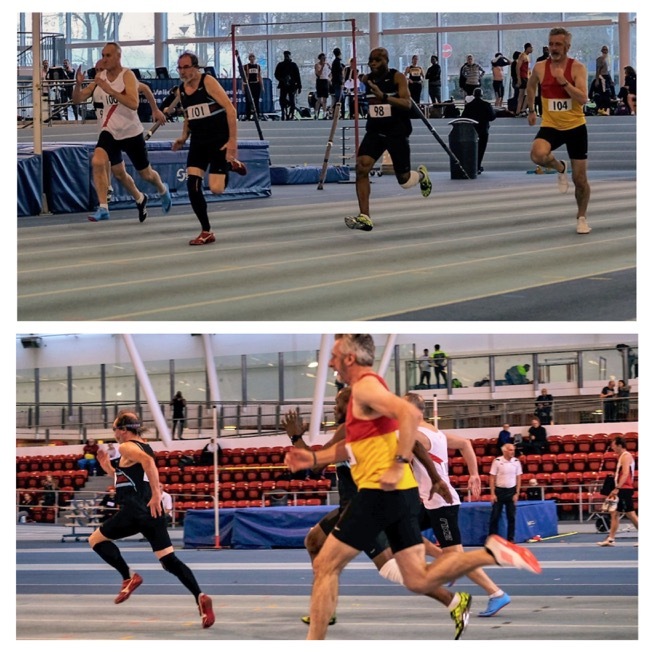 (Above) The 60 metres race at the Southern Counties Masters Championships in February 2019. The point at which I realised I was racing better than expected. I'm very grateful to Craig Beecham for these photos. 2019 is a "big year" for me in some ways. In late March, I turned 65. That moved me up a Masters Athletics year group. Rather pleasingly, just ten days before that birthday, I'd won a bronze medal in the 60 metres at the British Masters Championships. Not bad at 64 years, 11 months and three weeks of age. I came into the year with plans to be the youngest M65 athlete at the World Masters Championships in Poland at the end of March. It began two days after my birthday. However, when the time came to make an entry for those Championships, I was running badly, and carrying several irritating, niggling injuries, and didn't have the faith to think things would improve in time. I also had the opportunity for another trip to Venice, which overlapped with the Worlds. Result: I didn't go. I'd have been running well, at 60 metres at least. My decision, so I'm living with it! 2019 also sees my 50th year as a member of what was Blackheath Harriers when I joined it as a young teenager. It's been my club (it's now "Blackheath and Bromley Harriers Athletics Club") through thick and thin, including the 15 years when back injury meant I couldn't compete as a track athlete. A few years back, I was honoured to be made a Vice President of the Club. I've just begun planning my competitive season on the track. All being well, (and last year taught me you never can bank on anything as an older athlete) it will culminate in the European Masters Championships, in Lido di Jesolo, Italy. There's a load of useful general stuff here. 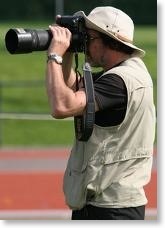 If you want my Masters Athletics work, it's here. If you want an overview of my other galleries, it's here. My Maidstone Parkrun photos (mostly 2015 and 2016), are included here. If you want a link to my two blogs, click here. If it's my Great Dolomite Road project you want, it's here on its own web site. There's stuff here about buying from me.